Eddie Tana has taking a few years of from tattooing the public but still has been tattooing for his long time clients but for 2016 he is now back at OC Tattoo and still tattooing his clients from decades. Eddie Tana will now start tattooing walking-ins and take new clients and changing up his style he is know for like Japanese type tattoos he is now back to doing smaller tattoos portraits flowers roses, just about anything just like back in the days when he was tattooing everyone. The passion of just tattooing is back in full force so just email him eddietana@gmail.com or get social follow him on Instagram @eddieoctattoo email is faster calling the tattoo shop is goning to be difficult to contact him but you can always try to call 1-714-899-1144 and our staff will take the message. From being all over the place Eddie Tana is now back at OC Tattoo when he is not at Element Tattoo Supply now taking appointments for any tattoos needed from small tattoos to full back and full sleeves check follow his Instagram for more of his newest tattoo art coming soon! 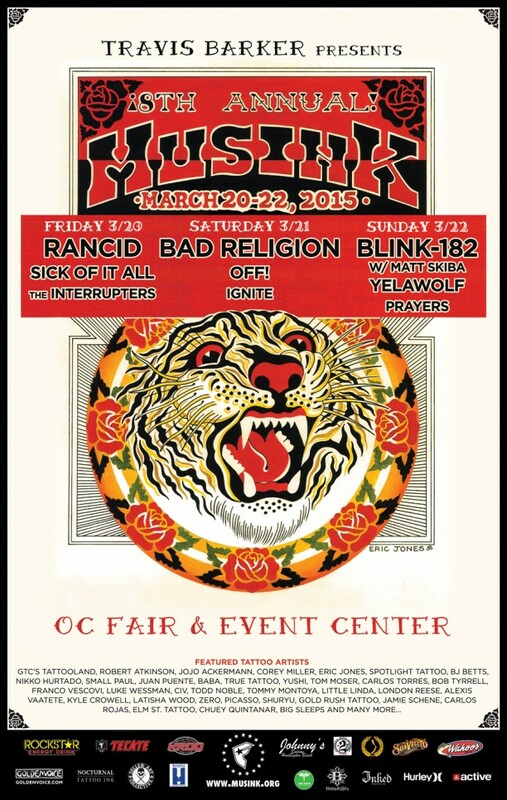 Join us here at the 8th Annual Musink Festival presented by Travis Barker 2015 we had a blast doing this tattoo convention not to mention we had 8 tattoo booths with tattoo artist guest tattooing in our booth artist like John Montgomery, BoogStar, etc..